Kee Hwang founded his Moo Duk Kwan® martial arts schools in Seoul Korea in 1945 where he taught his martial art system to eager students and american military personnel. In the early days of his Moo Duk Kwan® schools he named his martial art system that was taught in them Hwa Soo Do, then Tang Soo Do and later adopted the name Soo Bahk Do®. Today, only those organizations affiliated with the World Moo Duk Kwan are legitimately authorized to represent themselves as Moo Duk Kwan® schools providing instruction in the Soo Bahk Do® martial art system. The United States Soo Bahk Do Moo Duk Kwan Federation® has sole and exclusive license to use these trademarks in the USA, a right upheld by a Federal District court. 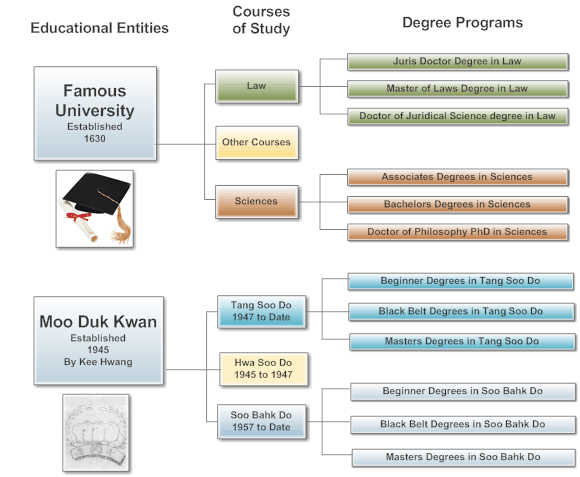 The distinction between "Moo Duk Kwan®" and "Soo Bahk Do®" is analogous to Harvard University and a Master's Degree in Science earned at Harvard. The degree is not the university and the university is not the degree, rather the university (Harvard ~ Moo Duk Kwan) is the source of the degree (Science ~ Soo Bahk Do) that is earned and issued. Kee Hwang's authorized Moo Duk Kwan® schools provide practitioners with the opportunity to earn rank and instructor certifications in his Soo Bahk Do® martial art system. Legitimate Moo Duk Kwan schools and their certified instructors have a direct connection to Kee Hwang's authorized World Moo Duk Kwan organization that has survived him. Any Instructor or school representing themselves as Moo Duk Kwan without that direct connection and license are engaging in fraudulent activity and trademark infringement. Practitioners who receive authentic rank or instructor certifications in Tang Soo Do and the Soo Bahk Do® martial art system through legitimately authorized Moo Duk Kwan® schools can proudly trace their unbroken lineage through their instructor and their instructor's instructors all the way back to 1945. Today, Kee Hwang's original handwritten records have been computerized and are continually updated and maintained by his successor, Hyun Chul Hwang, President of the World Moo Duk Kwan and Kwan Jang Nim of the Soo Bahk Do® martial art system worldwide. Every legitimate certification ever earned in Hwang Kee's martial art system by practitioners in authorized Moo Duk Kwan® schools has been recorded including those that have been revoked by him for behavior unbecoming a practitioner of his martial art system. If you are actively using the trademark MOO DUK KWAN or the trademarked FIST LOGO and you are not listed here or here, then you are engaging in trademark infringement and fraudulent activity. If you would like to legitimize your activity, connect to the rich heritage of the Kee Hwang's Moo Duk Kwan® organization and his martial art system and establish a license for use of the Moo Duk Kwan® trademarks, then you can begin by subscribing to the Soo Bahk Do® Institute and then contacting National Member Headquarters for instructions about how to proceed.